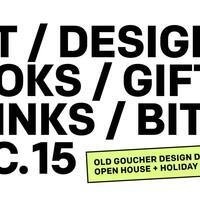 Post Typography and neighbors Co_Lab Books, Sophomore Coffee, and Larder are organizing a holiday shopping crawl on Saturday, December 15 from 11 am – 4 pm. Each Old Goucher business will feature special holiday offerings, including art prints, design books, ceramics, seasonal gifts, and food and drinks. Post Typography is opening our studio for our 7th annual print and ephemera sale. The one-day-only event features limited edition prints, posters, books, music, and apparel, including screenprinted tour prints for Future Islands and Dan Deacon, collectible Maryland Film Festival posters, and our classic Bill Murray Groundhog Day movie poster. Other goods for sale include vinyl records, T-shirts, signed copies of Lettering & Type, and other Post Typography publications. Post Typography is located at 2219 Saint Paul Street, Baltimore, MD 21218. Around the corner, Co_Lab Books will offer special discounts and seasonal gifts, along with their regular selection of architecture and design books and gifts. Sophomore Coffee will be setting up a pop-up coffee bar inside of Co_Lab serving coffee, tea, and drinking shrubs along with snacks from Larder. Sophomore will also have a small selection of retail items for sale, including coffee and handmade ceramics. Both will be located at Co_Lab at 2209 Maryland Avenue, Baltimore, MD 21218. At the new Socle complex, Fadensonnen will offer Glow Wine (hot mulled wine), as well as natural wine, beer, and cider. Larder will offer galettes, warm spiced cider, and herb and pepper salts at their café. Both are located at 3 West 23rd Street, Baltimore, MD 21218. Post Typography 2219 Saint Paul Street, Baltimore, MD 21218.